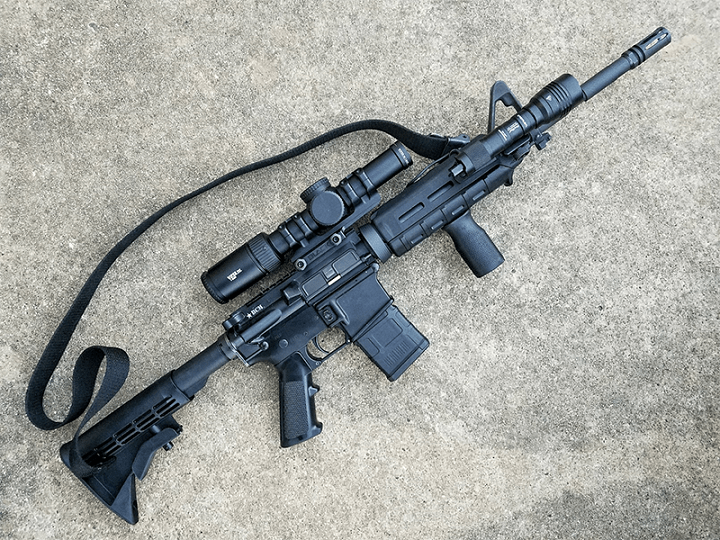 Because of the limited receiver length and the element of a reduction in effective range, there are times when finding the best scope for AR-15 is achieved by turning to a shorter tube. The less complicated 1-6X24 inch tube, as well as other close variations of this, are likely to do a great job. Keep it short, compact and effective for medium range applications. Then, your field will be a winner without question. This second focal plane Vortex Optics brings a class act outfit that builds some clean glass that won't leave you in the dredges of dim targets, rainbow edges, and sloppy optical problems. 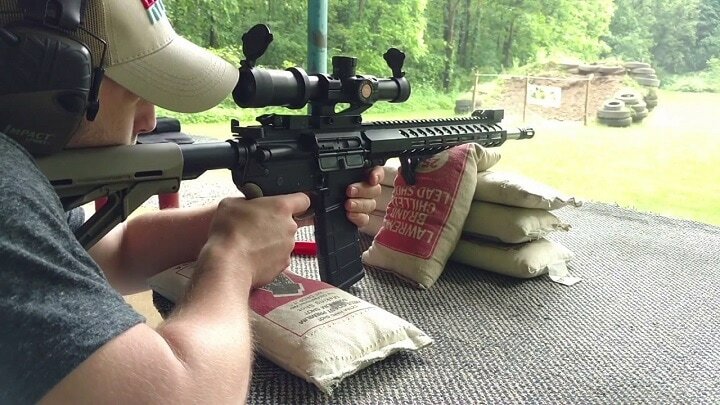 The Vortex Strike Eagle is AR-15/M-16 qualified and clean to the center of its turret settings. 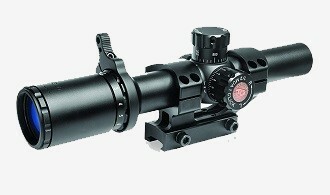 This scope is recognized by its ability to be used as a speed class sight. The glass promotes accuracy and in the 1-6 power setting, it is very workable under most medium range situations. 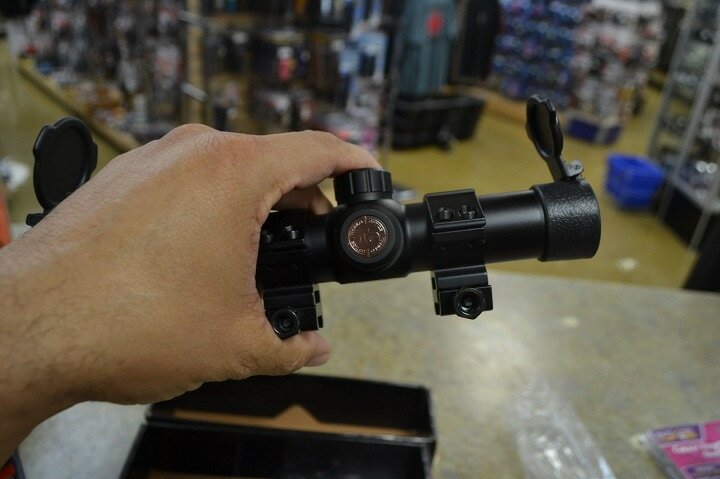 This scope is used by cops, military, or hunters to deal with what they encounter. 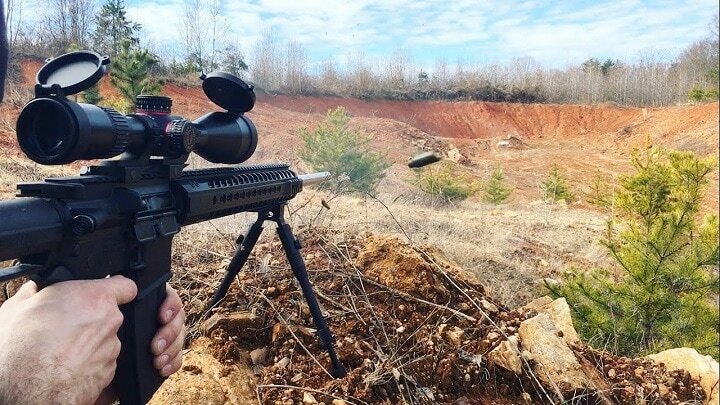 Let's face it folks east of the Mississippi River most shooting situations don't involve much more than 50 yards at the maximum. With the 4-6X24 inch tube, I have observed professional contractors make a stand against bad guys in the middle east. They are not just able to hold their own but win against massively unlikely odds. When paired with a good glass like the Strike Eagle, the M-16/M-4 are deadly tools. When the designation is AR-15, as was the case with these operators, nothing changed including the warm target hit count. With the low mag element used with this scope, the one power setting gives a wide field of view that provides the shooter access to a good deal of real-estate when viewed through the scope. Move to the 6X power setting and you're good to go for the long shot up to about 600 yards with ease. In truth, I have shot at targets and subjects for years and never moved my sight power setting beyond 6X. This is a deer hunter's dream power setting. This setting extends the range. Since you can mount this scope easily, you will find it to be the best scope for fast-moving game. The Strike Eagle makes use of fully coated lens surfaces. This feature allows the scope to pull in all available light transmissions in low light conditions. The illuminated glass etched BDC reticle retains eleven different levels of light transmission. This gives the shooter full control as light changes around target surfaces. Another nice feature regarding power is the extra battery that can be stored right in the windage cap of the scope's turret assembly. 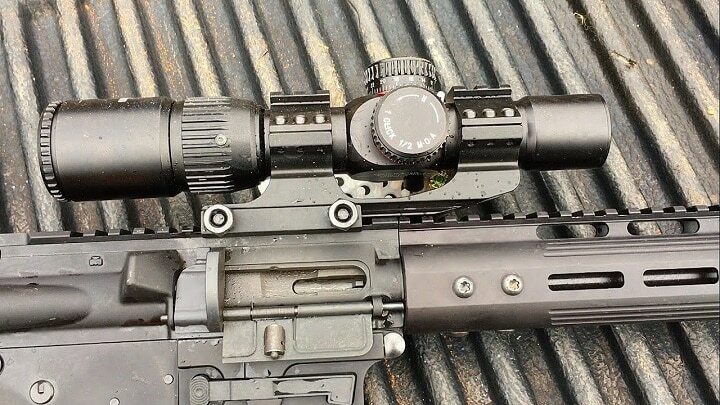 The turret caps on this scope are sealed with cap covers. This scope is not an open turret adjustable windage and elevation optic system. With the short to medium range shooting application, this is not generally an issue. The general use .223 Remington/5.56 NATO is not on the sniper's best choice list for the most part. ​The price tag of Strike Eagle Second Focal Plane varies, check the latest price at Amazon. 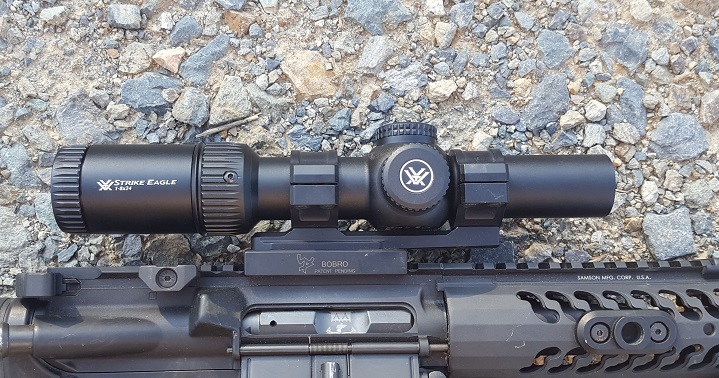 The Primary Arms Gen III SFP scope features the .556 reticle which applies to this paired AR-15 review. This reticle allows for fast, accurate target engagements. Built in the second focal plane SFF, the scope maintains the same subtension view regardless of the power setting level used by the shooter. The reticle on this scope is an illuminated unit with a red color designation applied to it. The shooter has 11 brightness settings for all levels of operation in various field lighting situations. The scope is powered by a CR2032 battery. 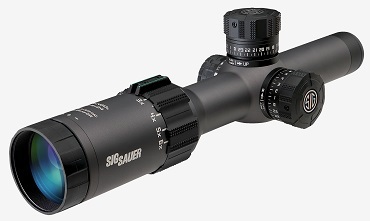 Formed from a single piece aluminum body, this scope features coated lenses and has a gas-sealed assembly. This waterproof, fog proof scope is built tough and as a field tool, it is one of the best optical systems. Making use of the 1-6X24 power range the scope is a medium-range tactical applied instrument. As such, the scope meets the demands of both law enforcement and military applications as well as civilian gun games and hunting preferences. The system's lifetime warranty covers the scope for the life of the owner. The price tag of Primary Arms 1-6x Scope varies, check the latest price at Amazon. This scope is a high precision tactical optic using a 1-6 magnification zoom system. 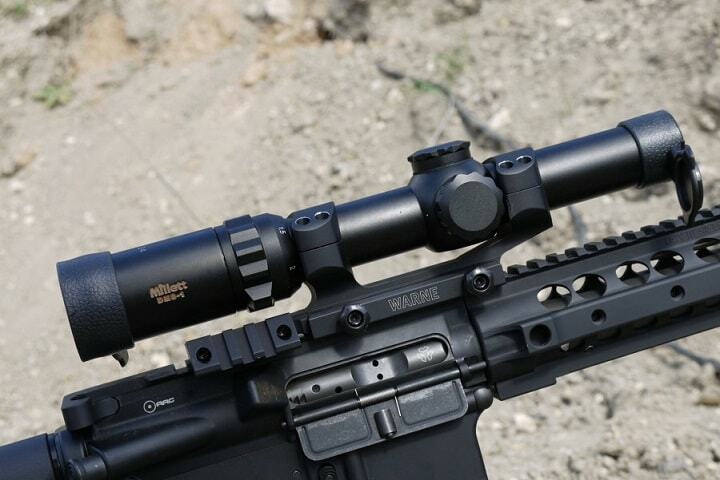 The main forward bell on this scope measures 24 inches in keeping with other short length tactical glass sights. 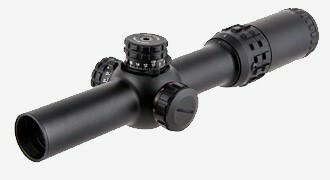 This scope retains an eye relief of 4 to 4.5 inches and is designed as a first focal plane system. This means the scope will increase sub-tensions size as magnification levels are increased. This an advantage when shooting with higher power at a long range or trying to clearly identify a possible target. I call this system "search and shoot." 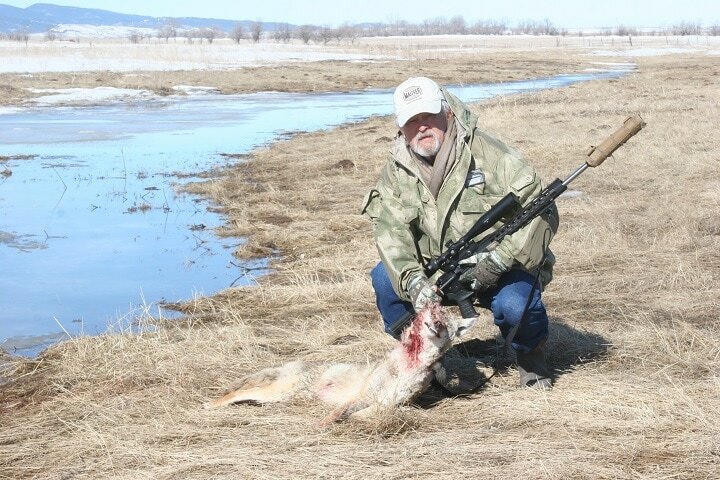 It is used often in big game hunting and also long range varmint applications. This scope has a dial controlled reticle that is based on both red and green color illumination. Brightness controls make use of low- or high-intensity reticle elimination for varied target acquisition situations. In effect, the sight is used for the shot being taken. 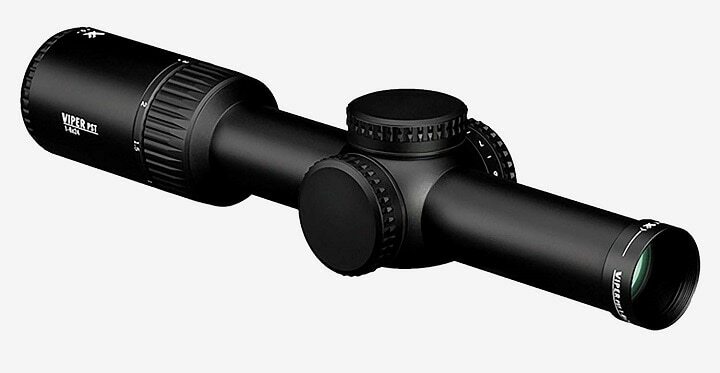 This scope is built of aircraft grade aluminum. It features a 30mm tube that is sealed and gas-filled. Because the system is water resistant and fog proof, this unit is workable in defensive or assault situations. When a more modestly priced unit is needed, this one should be considered. The manufacturer also includes a one-piece scope mount assembly, a sunshade in a honeycomb pattern, and see-through lens covers. The price tag of Monstrum Tactical 1-6X24 Scope varies, check the latest price at Amazon. The Truglo TRU series 30 is a tactical optic that is backed by years of experience in building illuminated reticule systems as in red dot and Hi-Viz sights for both shotguns and rifles. In this case, the company has jumped straight into the development and manufacturing of high quality AR-15/AR-10 sight systems, depending on which of two BDC turrets systems supplied with your scope (5.56mm or 7.62 NATO). This sight makes use of a 30mm tube for increased brightness and advanced click adjustments. Large tubes always mean bigger and better optical parts and fittings. 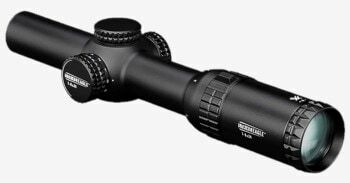 This quality scope is built to take field wear over many seasons of big game or varmint hunting in harsh conditions. The pair of BDC pre-calibrated turrets allow the scope to be used between the larger 30 cal 308 Winchester and the 22 Cal Remington .223. This is an advantage when trying to stretch the budget a bit in terms of what the hunters/shooters own in rifle glass. 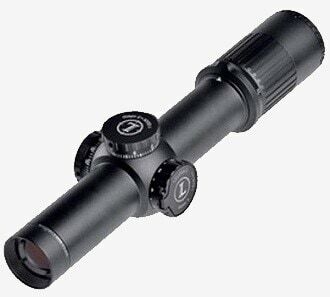 This scope also comes with a set of monolithic 30mm scope rings/mounts that are CNC machined from aircraft grade aluminum. Windage and elevation adjustments are ¼ MOA against a 24 mm objective lens. This scope measures 9.5X3.2X2 inches and weighs 3 pounds. Mildot reticle is offered as red and green in color. At one power, the scope is designed for fast moving close range targets, whereas the MOA reticle in a duplex design can be utilized at long range with the ability to also range targets by way of the MOA sub-tensions pattern. The price tag of Truglo TRU-Brite 30 Scope varies, check the latest price at Amazon. 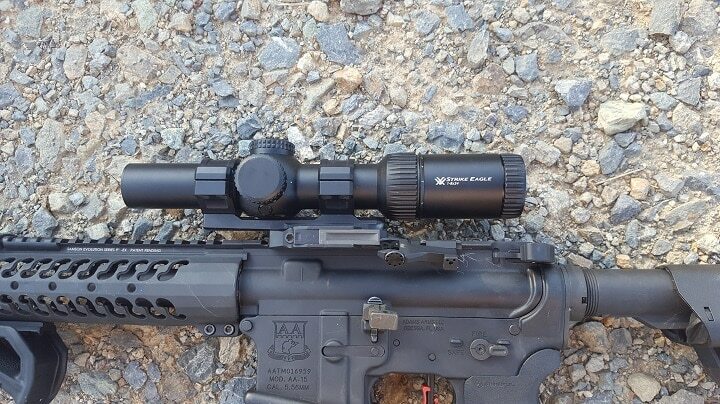 As a second Monstrum AR-15 platform scope, I have selected the 1.5-6X24 Compact series glass sight. 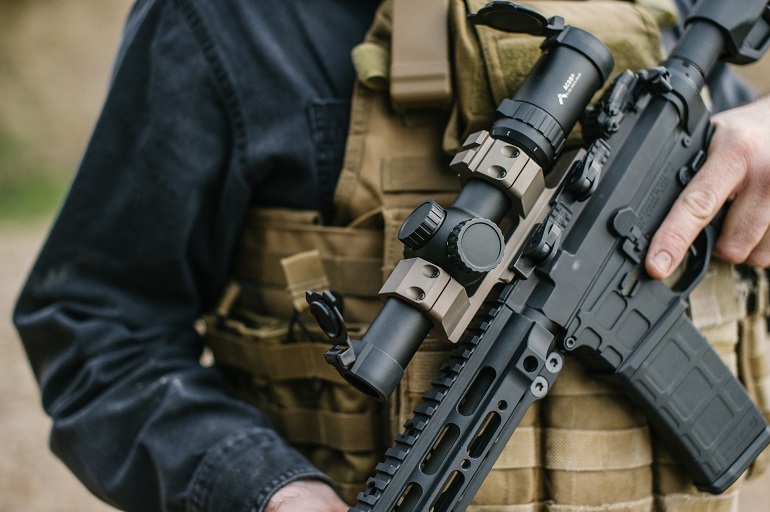 In keeping with staying away from tree truck logs on the top of a smaller weapon, this company has presented the compact series of rifle glass in the tactical format. This scope provides a clear target acquisition from the 24mm objective lens. The tube retains a long eye relief that, if necessary, can take recoil bounce. The Mildot reticle allows for fast changes in hold over on moving or static targets out to extended ranges. The system can also be used as an effective ranging process as well. Red and green color options are included in the reticle system. The sight can change with the light conditions found on target ranges. Low light shooting can be adjusted for as well as extremely bright surface conditions. 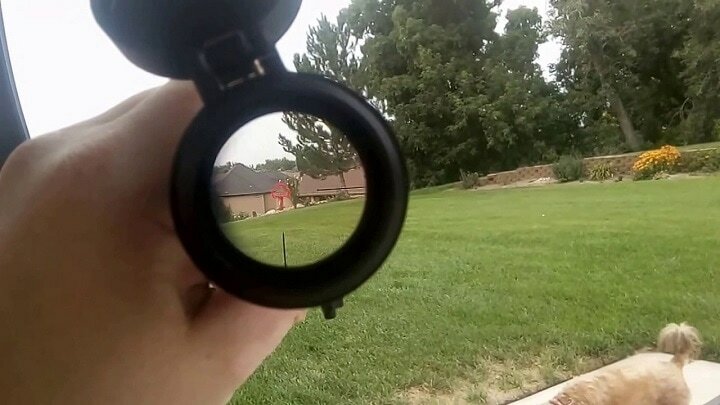 You will never understand the issue here unless you have been involved in a situation where the target was right in your face, but your optical system failed. You could just see a red glowing halo over a dark surface area. That is called a bad deal--no matter how you cut it. Author AR -15 Long Range. Performance is changing as applied to the AR-15. With the development of the very new .224 Valkyrie on the standard AR-15 platform, the range has increased to a total of a supersonic 1500 yards. 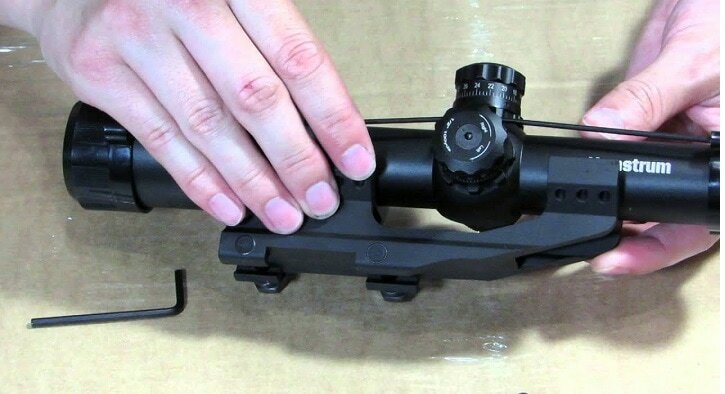 This scope is built with an integrated rail mount that is compatible with Weaver-style rails (all AR-15 platforms). The rail mount retains a see-through design. This allows rapid point blank target acquisition in an instant whether you find yourself facing a room clearing situation, a running Russian reded boar coming at you straight out of the think cover of a Russian swamp, or a Texas backcountry section of thick bush. When speed really counts the option of an open sight window can be a real lifesaver. With a total length of seven inches and a light weight of 11 ounces, this scope is a workhorse as an ultra-compact sighting system. The price tag of Monstrum Tactical 1.5-6x24 Scope varies, check the latest price at Amazon. Dubbed the “ Designated Marksman,” this scope is much like that carried by a squad level combat solder selected to take care of long range terminating functions. When called up in the “ sniper up” mode of operations, this scope can do the work. 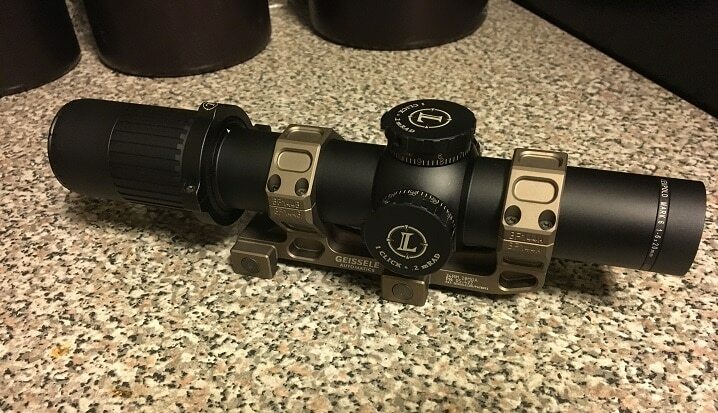 I have this very scope in the 1-4 version that was sold a few years ago. It is very heavy and made to stand the test of time. It has been used on the AR platform and also the Rock River modified AR/AK platforms in 300 Blackout as well. This optic retains a lighted eleven advancement clicks reticle ( red dot ) with elevation and windage subtensions. Correction for bullet drop is accomplished by way of MOA drop indicators on the lower line of the sight picture. This optic is effective from 5 to 500 yards depending on the combat level activity or simulated level of target games. 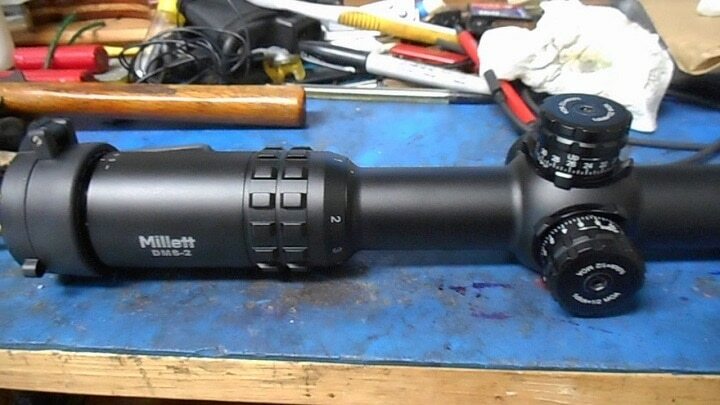 The price tag of Millett DMS-2 1-6X24mm Scope varies, check the latest price at Amazon. This Sig combat scope in the 1-6X24 SFP optical system is a dead ringer for several others sold in this category. 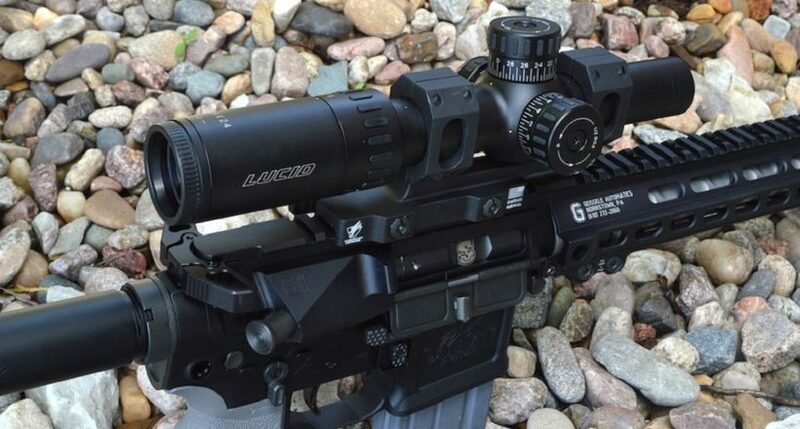 These scopes are functionally designed as combat unit sharpshooter level optics. They carry a single purpose to lay down lead with accuracy at zero range or down range to 500 or more yards. 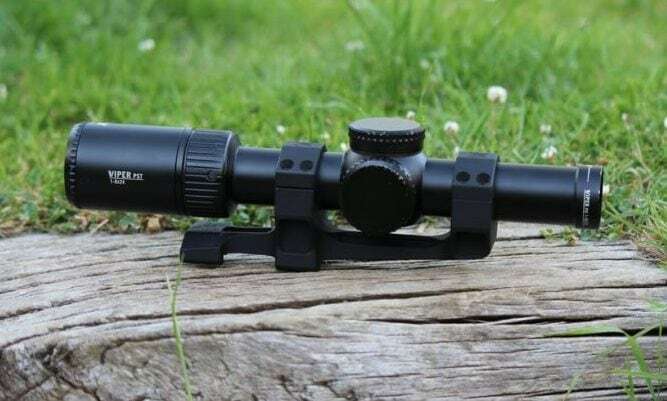 This scope makes use of the 300 Blackout horseshoe dot reticle and carries MOA adjustments for windage and elevation with a field of view of 98 feet at 100 yards on low magnification. The scope is designed for both AR and blot gun platforms. This military grade scope is the solution to mid-range combat requirements, and as such, it is built to these standards. The sight retains low dispersion LD glass which is industry leading in terms of advanced optical manufacturing. Offered in the first focal plane FFP, with multiple reticle illuminated options. Eye relief in this unit measures 84mm. The price of SIG Sauer Tango6 varies, so check the latest price at Amazon. FFP first focal plane scope with a 34mm reticle. 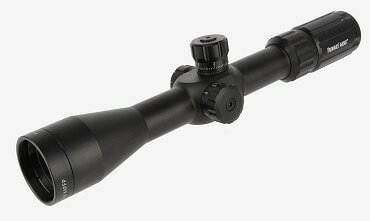 This 1-6x rifle scope is the grand entry model of combat scopes as it has ultra high quality. The price shows that to be indeed a fact. 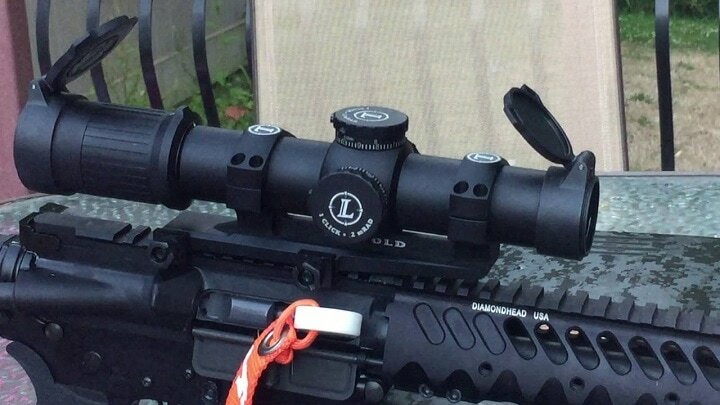 The Leupold Mark 6 is an illuminated reticle scope. The system is based on many years of elite, military forces operational use. From competition shooters to tactical operators, this scope has totaled up some impressive time in the field. Being all U.S. built by American workers, this is a real for sure U.S.-based optical system. As far as optics, I have used Leupold glass dating all the way back to the early 1960s. Today, I use the famed military based M4 on my M-24 sniper rifle and the M-6 in MRADS on my 300 Win Long Range rifle. I have never had an issue with any of them. This optic system is military oriented. The tube is one piece of heavy constructed aluminum. The glass retains design elements to keep the target image crystal clear at variations in lighting transmission. Flexible reticle selections are available from Leupold for this sight. The Turret type is open with MOA or MRAD marked adjustment points for elevation or windage. The price of Leupold MARK 6 1-6X20 Riflescope varies, so check the latest price at Amazon. This Viper by Vortex maintains a 1-6X24 operation lens reticle and makes use of some sophisticated systems in terms of sighting and aiming. This scope is built in the second focal plane. SFF meaning that the reticle image stays the same regardless of the power setting employed by the shooter. 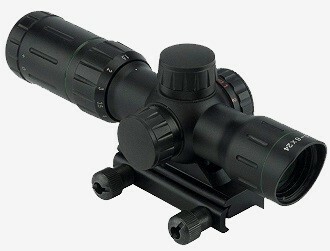 This scope is a close to medium range optical system. It features mounting laser etched turrets for the shooter to locate exact elevation or windage setting in a snap. The optics retain 10 light intensity levels. The low light dispersion glass increases resolution and color fidelity. The lens system is fully multi-coated for protection and positive field function. Armortec protects the lenses from developing scratches or other related damage that can occur in the field. Tube construction is military grade and of a single piece design. This whole unit is well made. The buyer can expect many years of service out of the scope. The scope is built for operator use and competitive shooting events as well. That is a jump of 700 to 800 yards beyond standard operating ranges associated with the .223 Remington round in most shooter's hands. Select your optics with care and be sure you're buying enough glass for the task at hand. The price of Vortex Viper Gen II varies, so check the latest price at Amazon. Got questions about a product or other related information? Give us a bit of feedback. We will be very happy to assist you. We do our best to assist the reader in making an informed decision about products. Today we are living at a time when shooting sports and related products are at the very top of their game. Huntingmark.com has not got all the answers. Believe me, no one has that at their finger tips, but we have a whole lot of them and we are always happy to share.